Gallery Idol Round 3 - Fabric meets Paper!! Ok, here I am in the Top 10 of Gallery Idol Competition run by Papercrafts Magazine. I'm SOO excited to have made it this far, thank you for all of your votes. You helped me get this far!! The theme for round 3 is 'Fabric Meets Paper'. I spent ages playing with different ideas but I went with Kanzashi in the end. If you haven't heard of Kanzashi before here's a little bit about it. 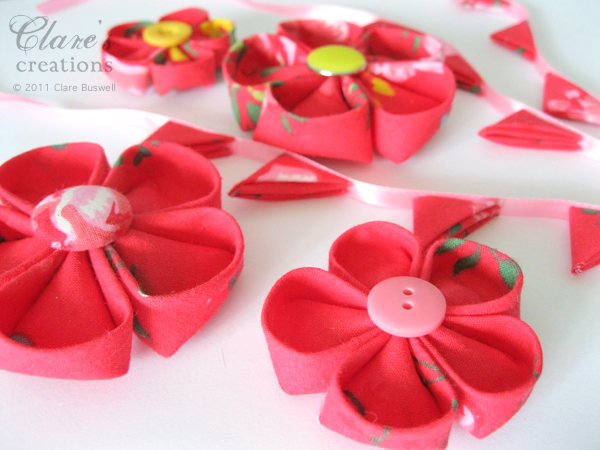 Kanzashi are Japanese flowers created by folding small sqaures of fabric into petals then gluing them together. Here's a link to a tutorial. You get nice crisp lines if you iron the folds. I covered a button with the same fabric for the centre. The leaves I cut from some green felt and stitched a line along the middle. I used the Say it Loud stamp set by Waltzingmouse Stamps for the sentiment stamped in black, carefully cut out and attached with foam pads. I stamped the wishes text using True red ink. 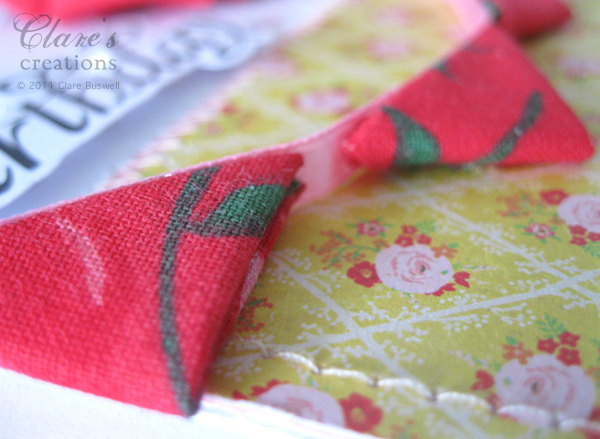 The white backround is embossed using the In Stitches embossing folder. The pretty floral paper is from Crate Paper's Emma's Shoppe. 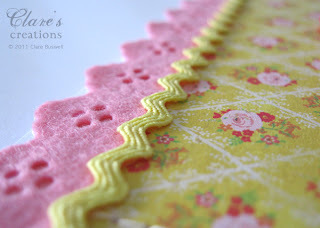 I die-cut the pink border using Marianne Design Lace border die from felt. I added some yellow ric-rac across the join. 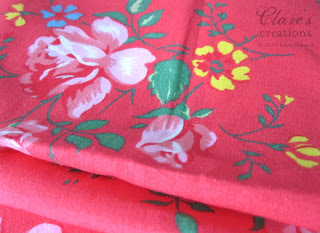 Here's the fabric I used to make the Kanzashi flowers and banner. I LOVE this fabric, I bought it ages ago from a local fabric shop. I love the pattern, the color combo, it's just so cheerful and pretty. I'm not usually a red fan but I love it in this mix of colors.. the fact it's a floral probably helps too!! : ) This was the color inspiration for my card. 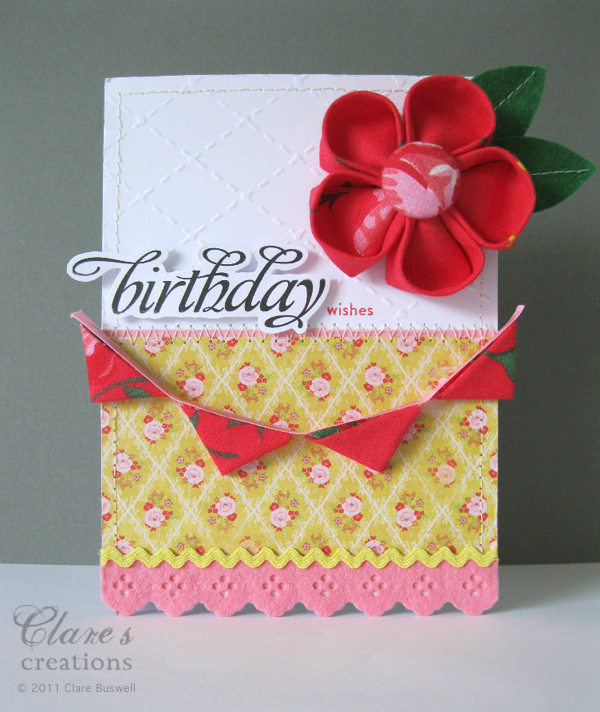 Well done, Clare - your card is so striking! Love all the textures and elements you added - good luck!! Clare: I absolutely LOVE your card!! The flowers are just perfect, and I love the banner done in fabric also, and the felt border and the stitched leaves, and the ric-rac. (Oh, and the fabric covered button too!!) You did a lovely job! Congrats on getting to this round, and I'm off to vote for you. Have a great week!! Hugs! oh wow, Clare, that flower is gorgeous! You did such great job this round!!! Such a pretty and very neat flower! Great card. I can see that this round we can vote EVERY DAY! Also this card is again very good. Nicely with the flower. A very nice as a whole. Have the map of July 18 also a reaction. Wow! Clare - that flower is really fabulous - the fabric is so pretty. And your card is just wonderful. Wishing your so much good luck!! Off to check out the Top 10 now! Clare this is gorgeous!!! I love the flower you created! Wow! You have my vote again, for sure!! So creative, lovely colors and perfect stamps for sure! ;-) Hope you win! Clare, your card is just over the top gorgeous! I'd love to see you create a tutorial on making these flowers (or point me to one that's already in existence). You got my vote! I love these flowers! Thanks for the link and bringing them to our attention as I've never heard of them! I am off to vote for your fantastic card! Best of Luck! Clare - oh my goodness, this is such a great card...and this K thingy...you know I will have to have a go at that...love the fabric and the felt and the paper and the ric rac...augh...it's so, so perfect....now I'm off to vote. I'm back to say you will definitely be in the last 5 if there is any justice in this world. LOL!! Simply amazing! Love that flower! Off to vote! So beautiful, Clare, and so perfectly done. I always love the brightness of your cards! Ohhh, those flowers... 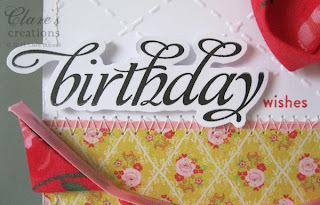 I'm under the spell of this card, it's so full of texture and dimension, just how I like it! Sheesh...how did I miss your tutorial link?! Sorry I was in such a hurry and missed it! Gorgeous flower! Love how your card came together with all the fabric pieces and rick rack too. Just lovely! I am totally gobsmacked by your creatvity and fabulous use of fabric. Your card is just beautiful and gorgeous, and so amazing. Beautiful Clare, the flower is wonderful, and the mix of colours are so cheerful! 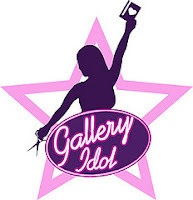 Good luck with Gallery Idol! You've got my vote! Gorgeous! Lots of fabric too! Well done. Love the colours. Oh my word ... this is s beauty ... fabulous work ... love your flowers and the banner ... fingers crossed! Your details are wonderful...love the look of the crisp fabric bloom! Clare, so much to love about this card!! Those flowers are gorgeous - thanks for the link! Love that embossing folder, too :). Beautiful card!!! Beauuuutiful card! Have voted for you!! Well what can I say such a gorgeous card I've looked at the others and yours is definitely my favourite!! Good luck with the competition hope you make it through to the end. Love this one! Gorgeous flower. 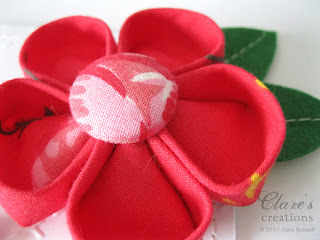 Gorgeous flower you've created using fabric, it does have such nice clean lines and that makes it really stand out. Wonderful bright colors too. Good luck in this round! Gallery Idol Round 2 - Creative Die Cuts!! WMSC56 and a big thank you! Gallery Idol 2011 - I need your votes! !